The 189-foot-tall Atlas 5 rocket ignited its RD-180 main engine and a single Aerojet Rocketdyne strap-on solid rocket booster at 7:48 p.m. EST Friday (0048 GMT Saturday). The launcher soared eastward from Cape Canaveral’s Complex 41 launch pad to kick off the 75th flight of ULA’s workhorse Atlas 5. Combining to generate more than 1.2 million pounds of thrust, the RD-180 engine and strap-on booster steered the Atlas 5 through a starry sky on a crisp winter evening on Florida’s Space Coast. The solid-fueled booster burned out and dropped away from the Atlas 5 about two-and-a-half minutes after liftoff, leaving the Russian-made RD-180 engine to continue firing until around T+plus 4 minutes, guzzling a mixture of refined kerosene and liquid oxygen. The Atlas 5’s Centaur upper stage next took over, with its single hydrogen-burning RL10C engine performing two firings, first to enter a preliminary parking orbit, then to drive the U.S. Air Force’s fourth dedicated Space Based Infrared System satellite into an egg-shaped transfer orbit stretching nearly 22,300 miles from Earth at its farthest point. A ULA engineer monitoring telemetry from the Atlas 5 rocket transmitted through a ground tracking station on an island in the Indian Ocean announced a signal confirming deployment of the SBIRS GEO Flight 4 satellite on time about 42-and-a-half minutes after liftoff. Lockheed Martin, builder of the SBIRS GEO Flight 4 spacecraft, said ground controllers with the Air Force’s 460th Space Wing established contact with the newly-launched satellite soon after its release from the Atlas 5’s Centaur upper stage. 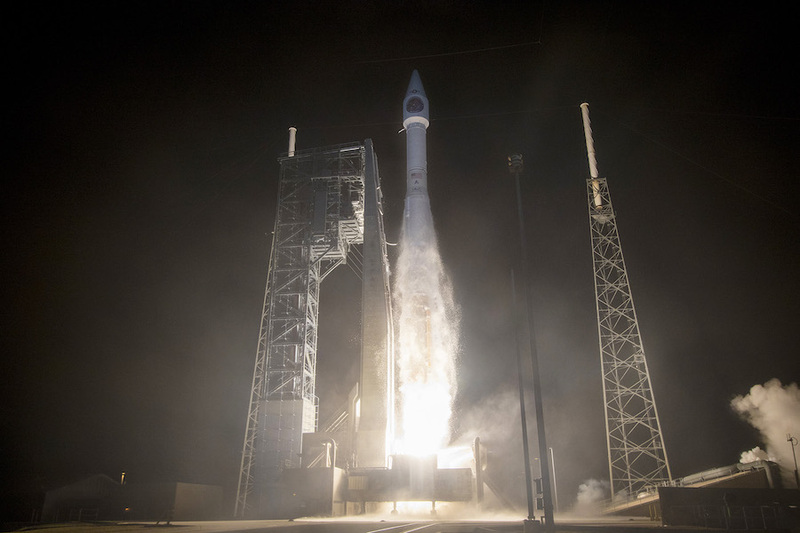 The on-target launch Friday extended the Atlas rocket program’s streak of successful flights to 146, a record dating back to 1993. It was also the second ULA launch in a week, coming seven days after a Delta 4 rocket placed a top secret spy payload in orbit after blasting off from Vandenberg Air Force Base, California. 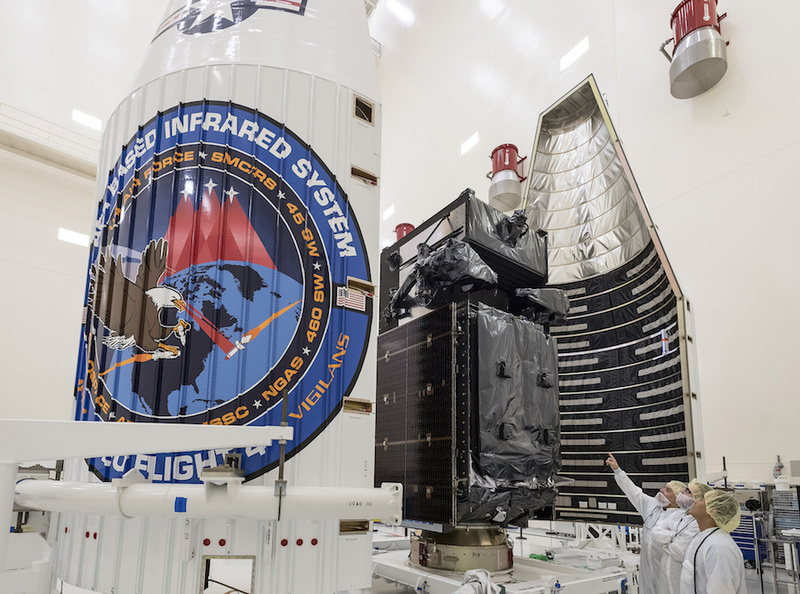 The $1.2 billion SBIRS GEO Flight 4 satellite launched aboard the Atlas 5 rocket will finish the initial deployment of the Air Force’s new-generation missile-warning network. When complete, the constellation that will include a minimum of four SBIRS craft stationed in geosynchronous orbit and at least two infrared payloads in elliptical orbits aboard top secret National Reconnaissance Office spy satellites, providing polar coverage. The SBIRS fleet is the “bell ringer to a launch anywhere on the face of the planet,” said Col. Dennis Bythewood, director of the remote sensing systems directorate at the Air Force’s Space and Missile Systems Center. The SBIRS satellites carry sharp-eyed infrared sensors to detect heat plumes from rocket launches, feeding data to the military about the origin and trajectory of missiles that could be heading for U.S. territories, deployed troops, or allies. The information gathered by the SBIRS fleet could help defense units intercept an incoming missile before it strikes its target. 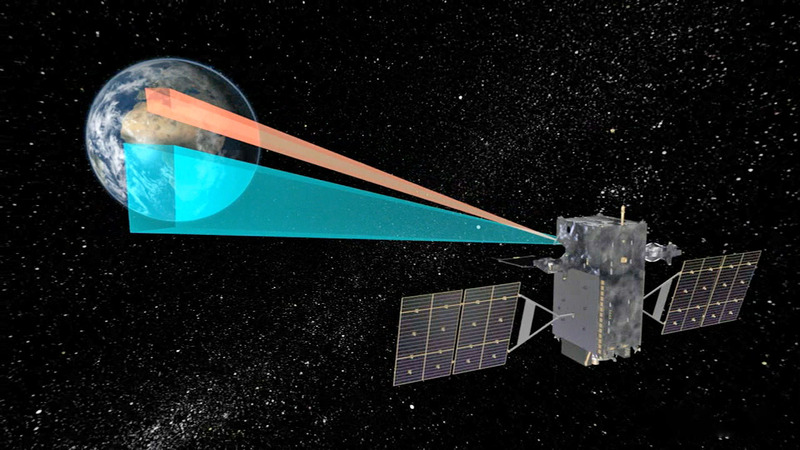 The SBIRS infrared payloads are provided by Northrop Grumman, and each package on the geosynchronous satellites includes staring and scanning sensors designed to provide visibility over an entire hemisphere, while allowing ground operators to focus the craft’s gaze on hotspots like North Korea. “The succesful launch and operation of this fourth SBIRS GEO satellite will mark the completion of the SBIRS baseline constellation,” Bythewood said. 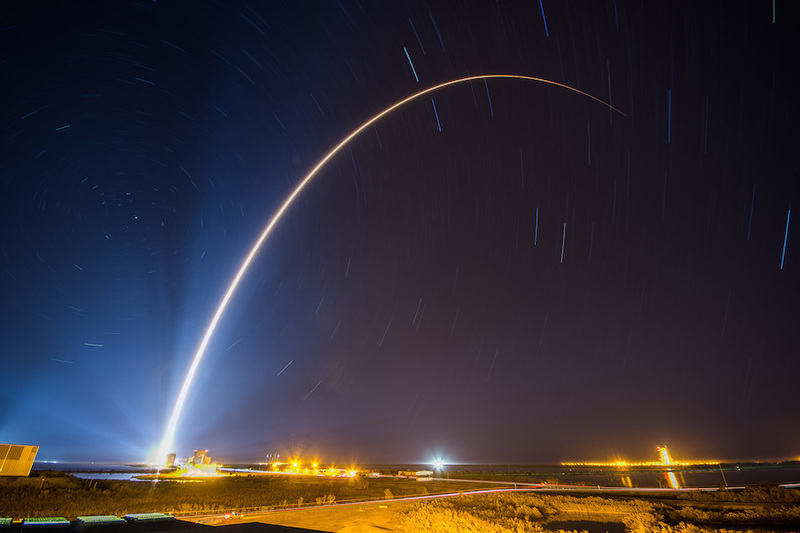 “SBIRS is intended to replace the legacy Defense Support Program satellites that have been providing missile warning for worldwide missile launches since 1970. The SBIRS GEO satellites are based on a militarized version of Lockheed Martin’s A2100 satellite bus, and each spacecraft weighs about 10,000 pounds fully fueled for launch. While the Air Force does not publicize the coverage zones for each SBIRS satellite, amateur trackers believe the three craft previously launched are positioned to detect missile launch activity in Europe, the Middle East and Central Asia, and the Asia-Pacific. That makes it likely that SBIRS GEO Flight 4 will be parked 22,000 miles over the Americas to round out the SBIRS network. 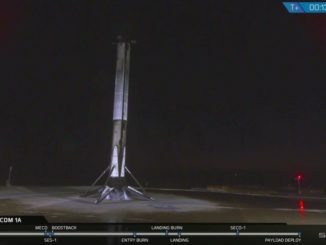 “Adding the fourth satellite to the constellation allows us to provide worldwide geosynchronous coverage,” Bythewood said. Like other military and commercial satellites in geosynchronous orbit, SBIRS GEO Flight 4 will move around Earth at the same rate of the planet’s rotation, allowing it to hover over a fixed geographic location. In the coming weeks, SBIRS GEO Flight 4 will fire its on-board engine multiple times to circularize its orbit at geosynchronous altitude. The maneuvers will also shift the tilt of the satellite’s orbit to the equator from roughly 17 degrees — the drop-off orbit targeted by the Atlas 5 — to 0 degrees. The spacecraft will unfurl its power-generating solar panels, antennas and a light shade to protect its infrared sensors from sunlight. Bythewood said information collected by the the Air Force’s missile-warning satellites could not only be used to warn of an impending attack, but could also help thwart false alarms, such as the accidental emergency missile alert activated by Hawaiian authorities Jan. 13. The two additional SBIRS satellites are under construction by Lockheed Martin have not been assigned launchers. ULA’s Atlas 5 and SpaceX’s Falcon 9 will compete for the job. 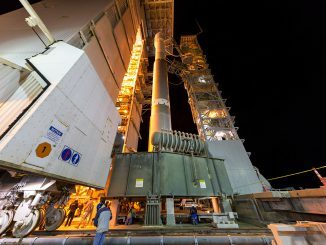 Friday night’s mission was the first of up to seven Atlas 5 launches planned for 2018, a manifest that includes the deployment of a new NOAA weather satellite, a secretive military payload, NASA’s InSight Mars lander, an Air Force communications satellite, and up to two test flights of Boeing’s CST-100 Starliner commercial crew capsule — one on an unpiloted mission, followed by a crewed two-person demo flight that could blast off by the end of the year. Six of the seven Atlas 5 flights planned this year will depart from Cape Canaveral, while the robotic InSight lander will be dispatched to Mars from Vandenberg Air Force Base, California, in early May. The launch of the SBIRS GEO Flight 4 satellite Friday differed from past Atlas 5 flights with SBIRS payloads, which used the basic “401” Atlas 5 configuration with no solid rocket boosters. Friday night’s flight employed the Atlas 5-411 version with a single strap-on booster. The Air Force and ULA ordered the change to give the Atlas 5 enough power to place the SBIRS GEO Flight 4 satellite into its intended elliptical geostationary transfer orbit, while leaving the Centaur upper stage with enough leftover propellants to conduct a de-orbit burn to plunge back into the atmosphere over the Pacific Ocean. The de-orbit maneuver was designed to ensure the launch did not add to the space debris problem in Earth orbit. Air Force officials said future Atlas 5 launches for the military could carry extra boosters to make controlled re-entry maneuvers feasible. 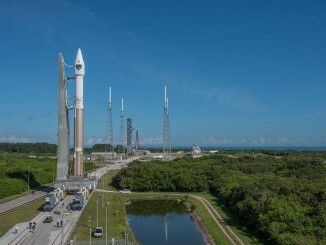 The next Atlas 5 launch on ULA’s schedule is set for March 1 from Cape Canaveral with NOAA’s GOES-S weather observatory.